Paper Doll Romance: The Second Day of Christmas Winner! On the second day of Christmas PDR gave to LAUREN ... a set of screen printed holiday cards from exit 343 design and a vintage, soy candle in Winter Mint by Melo Studios. Stephanie Harvey, of exit 343 design, is a very fun and friendly artist based out of Philadelphia, PA. Stephanie received her BFA from Rowan University and her MFA from Penn State. Primarily a printmaker, Stephanie takes inspiration from every day life and channels her artistic talents into unique and remarkable pieces like screen prints, cards, handmade notebooks, and more! She sells a variety of prints and cards in her shop that are vibrantly colored, bold, creative, and, best of all, funny. For example, are you feeling a little left out of all the save the dates and engagement announcements you've been getting lately? Get in on all that snail mail action and send one of Stephanie's "I am not engaged" greeting cards because..well..why should they get to have all the fun? 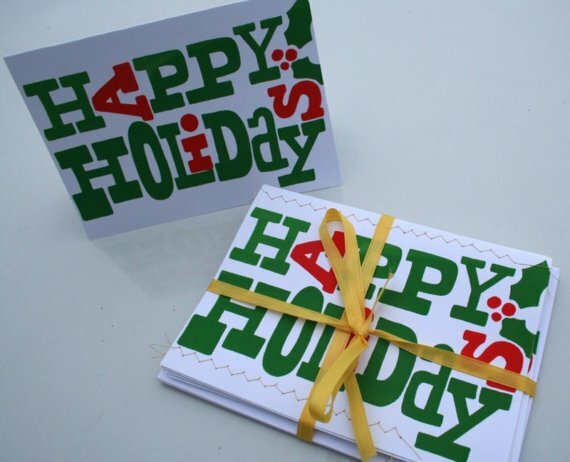 Lucky Lauren will receive this cheerful pack of Holiday cards by Stephanie Harvey. Festive red and green are silkscreened onto bright white card stock in a design meant to emulate the look of letter pressed cards. With the unique design and charming gold stitching, these whimsical cards are sure to make someone's holiday merry and bright. There's more? You bet! We're feeling generous today, so we've decided to also give away a really special item to accompany these cards. Liz and Olivia over at Melo Studios, in Ardmore, PA, make gorgeous candles that you can feel good about. These ladies strive to live a sustainable lifestyle and their products are made using only earth friendly ingredients. With soy based wax, essential oils, cotton wicks, and reclaimed or recycled glass, these candles are hand poured with mother earth in mind. These candles are fabulous, so much so that they are currently being sold in Whole Foods stores in Marlton, NJ, Philadelphia, PA, and more! In addition to the lovely holiday cards, Lauren will also receive this truly one of a kind soy candle by Melo Studios. Liz and Olivia were so kind to allow us to choose an item to give away to you and, after many minutes of touching and sniffing every candle on the table (they were all so great, it was hard to choose! ), we finally decided that this was the one for us, minty fresh and perfect for the holiday season. Thanks, again, to Stephanie Harvey of exit 343 designs and Liz and Olivia from Melo Studios for your very generous donations and for supporting our blog. Congratulations to Lauren for winning our Second day of Christmas prizes! Lauren - be sure to email us your address so we can promptly ship these to you.